What are the differences between the weBoost Home 4G and weBoost Connect 4G? Wilson Electronics has been in business for over 40 years, and has over 15 years’ experience with cellular technology. 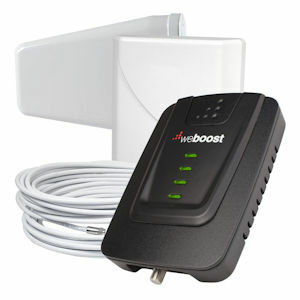 Two of their most successful 4G home cell signal booster products are the weBoost Home 4G and the weBoost Connect 4G. The Home 4G is $399.99. The Connect 4G is $549.99. 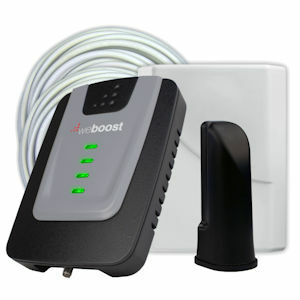 The Home 4G is the lowest-priced weBoost home signal booster kit. This is Wilson’s entry-level product for the home market. The Connect 4G is a step up in price and power from the Home 4G. The Home 4G and Connect 4G boosters are similar in size, shape, and weight. Both boosters have plastic cases. Both receive power from a standard 110-volt wall outlet. Gain is the booster’s increase in the signal strength it receives from the outside antenna, measured in dB (decibels). The Home 4G has a maximum gain of +60 dB. The Connect 4G has a maximum gain of +65 dB. Because the decibel scale is logarithmic, the Connect 4G’s additional +5 dB of gain means it has over 3 times the power of the Home 4G. The Home 4G and the Connect 4G have identical indicator lights on the front to indicate the amplifier’s status on different cellular frequencies. The Home 4G and Connect 4G both connect to their outside antennas with F connectors (the same kind used by cable TV and satellite TV systems). The Connect 4G also uses an F connector to run to its inside antenna, while the Home 4G uses a smaller SMA connector. The Home 4G kit includes two 30-foot lengths of white RG6 coax cable to connect the booster to the outside antenna. You may use just one length of cable, or connect the two lengths using the included barrel connector to create a 60-foot length. The Connect 4G kit has one 30-foot length and two 15-foot lengths of white RG6 coax cable to connect the booster to the outside and inside antennas. The different lengths give you more cable setup options than the Home 4G kit. Both kits also come with a 10-inch flat coax cable that can be run under a window to the outside antenna, if you don’t want to drill holes to run cable outside. The Home 4G’s inside antenna is a small tower that sits on a desktop, shelf, or other level place. It has five feet of thin RG174 cable that connects to the booster. The desktop antenna is directional and should be pointed where you want to broadcast improved cell signal. The Home 4G’s outside antenna is a directional panel with three mounting options: (1) Suction cup to the inside of an exterior window (included), (2) bracket mount on the outside on an exterior wall (included), or (3) mounted on rooftop pole (sold separately). The suction cup option is best for apartments, condominiums, and dorms, where there is limited or no access to mount the antenna outside. The rooftop pole mount will provide the booster with the strongest outside signal. The Connect 4G’s inside antenna is a wall-mounted directional panel antenna (wall-mounting kit included). This antenna can also be laid flat above a ceiling, so its signal broadcasts down in a cone shape. The Connect 4G’s outside antenna is a pole-mounted directional LPDA antenna. Mounting hardware is included, but the rooftop antenna pole mount is sold separately. The Home 4G has less gain than the Connect 4G. If your outside cell signal is weak, you shouldn’t expect the Home 4G to broadcast improved signal more than about 5 feet; if your outside signal is strong, the Home 4G will probably cover a small room or work area for a limited number of users. It also has the most options for mounting the outside antenna (window, outside wall, or rooftop pole), and its inside antenna requires no mounting at all; these features make it the better choice for renters, students, and condominium owners. The Connect 4G has more gain than the Home 4G. With a weak outside signal, the Connect 4G should be able to cover a small room; if your outside signal is strong, you’ll likely get coverage for two or three rooms for a limited number of users. Its outside antenna has to be mounted on your roof, and the interior antenna must be mounted on a wall or laid horizontally on the ceiling in your attic. It’s a more robust amplifier, but probably best for homeowners who have the ability and permission to install antenna and cables inside and outside the building.